This special quilt is for my son's teacher that was recently diagnosed with cancer and is undergoing chemo. The children participated in the making of the quilt for their teacher and I cannot wait for the children to see their quilt that will give Ms.V so much comfort. I will be taking it into the class to show them and I know they will love it! I used a Lori Holt Riley Blake Polka Dot Stitches jelly roll and Moda Bella White. 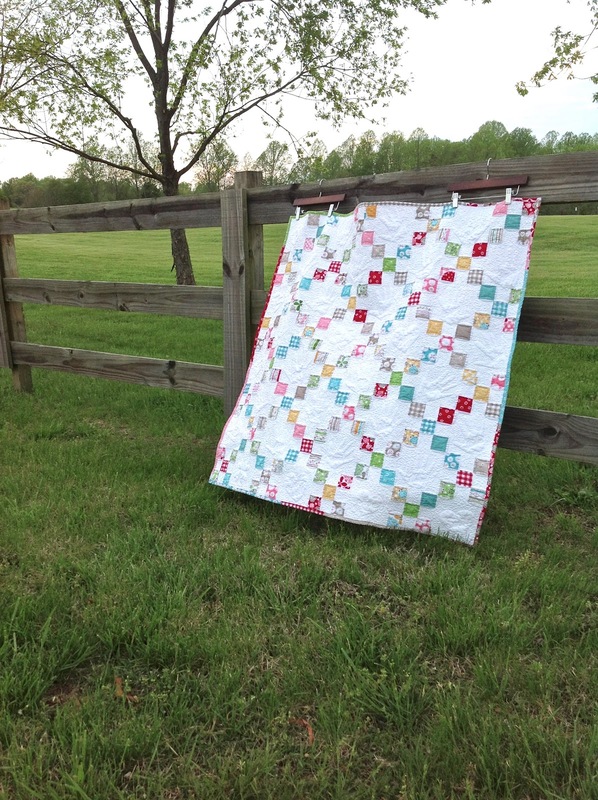 The piecing and quilting were all done with Aurifil 50wt. The batting used was Pellon Nature's Touch. See the sweet handprints? I could NOT have done this without the help of the a very lovely and talented lady, who I happen to adore! Laurie Tigner! She volunteered to quilt this quilt before it was even a real design, that is pretty incredible in my book and I ADORE and LOVE her to BITS!!!! She brought this quilt ( all quilts in fact) to life! THANK YOU LAURIE! I asked Laurie if it was possible to include the children's names in the blocks with the prints and she DID IT! I sent a listing of the names and a diagram of where each print was and she wrote each of the names with the print that goes with it. I am sure this will be loved for many many years! Thats so precious and cool! Shes gonna love it forever! This is so beautiful - the quilting is really amazing! I am sure it will bring comfort to your sons teacher. How special! What a lovely gift for the teacher to know she's thought about and cared for! How beautiful and precious...love the quilting and names...what a treasure to encourage her heart! Lovely! She will love this quilt. This quilt is amazing!! It has such a wonderful story and I know that she will love and cherish it! It is a beautiful quilt for an equally beautiful purpose. Just wonderful of you all to share your love and support in such a way. You are a true blessing. That is so awesome and so inspiring. What a lovely gesture. The teacher will be really touched by so much love. This is such a lovely thing for you to do. I'm sure it will be cherished. I love the hands and the names look like the crease in an actual hand. It is a beautiful quilt and the quilting really is stunning. She did an amazing job, as did you. Such a lovely thought, I'm sure there will be plenty of tears when she sees this. Quilting is beautiful, wonderful quilt for a special woman. So very sweet ~ Ms. V will love it! Gorgeous - what a truly meaningful gift. I am certain it will provide much comfort! I think this may be the most precious thing I have ever seen! I LOVE it. 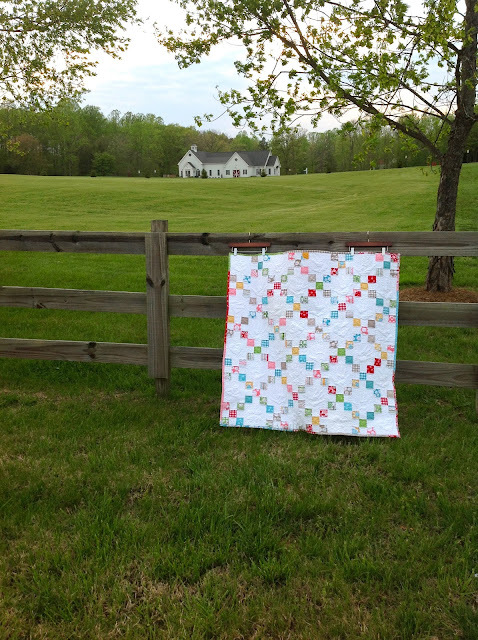 The handprints and names is a wonderful quilting idea. She will love it. Oh wow, that quilting is amazing, it finishes it off perfectly! What an incredible job you did Kim!! Will definitely bring a smile to the teacher's face. She will feel their love in her heart. Very special. What an awesome quilt. 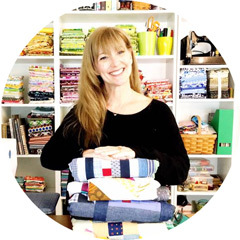 This teacher will cherish this quilt and she will always know her students love her. What a beautiful tribute! I'm sure the teacher will be overjoyed to have such a meaningful gift! WOW what a sweet and thoughtful gift! so neat all the kids got to help! and agreed the quilting is amazing! You've made me tear up. What a beautiful project for such a worthwhile purpose, and I bet those kids are going to adore seeing their hands and names on this lasting gift! As a teacher, and a cancer survivor, what an amazing gift. :) It's something that will be cherished forever. Wow that is an amazing gift for a teacher!! Beautiful quilt, and amazing quilting! This is such a precious quilt! What a special and wonderful quilt! The names in the hands is a wonderful idea. 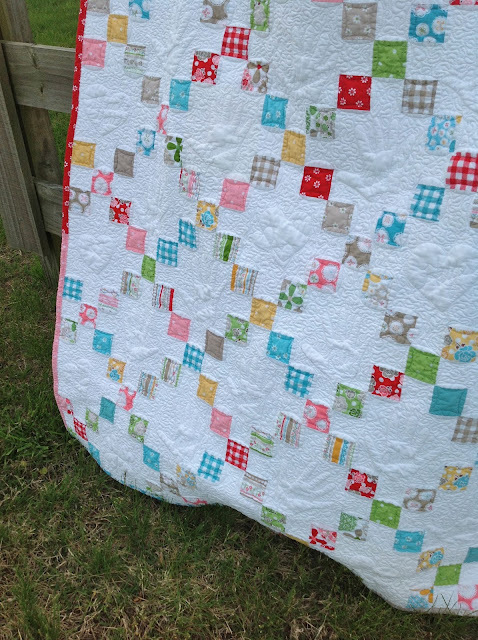 What a beautiful idea and so gorgeous in colours and quilting! It's was such a great idea and it turned out amazing! But what made it even more special was the extra love it got today with all the hugs from the kids! Ms. V will certainly enjoy this and God bless you for your vision! "Madison's MOM"